“Paul Moravec is one of my favorite composers of orchestral music.” On March 5, music director Gil Rose leads the Boston Modern Orchestra Project (BMOP) in a performance of Moravec’s oratorio The Blizzard Voices, joined by vocal soloists and the New England Conservatory Concert Choir. 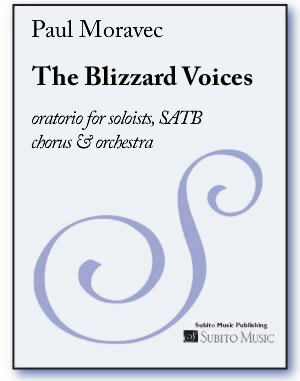 The Blizzard Voices is based on Pulitzer Prize-winning poet and essayist Ted Kooser’s book of the same name, and is scored for five soloists, SATB chorus and orchestra. The story chronicles the historic “Children’s Blizzard” of 1888 — a shockingly fast-moving snowstorm that suddenly struck the Midwest Prairie. Due to the sudden, drastic changes in the weather, hundreds of unsuspecting people succumbed to the storm, and a large number of its victims were children who were trying to return home from school. Rose continues, “The chance to build ongoing relationships with composers is one of the really unique things about BMOP. We released a CD of Paul’s music, Northern Lights Electric in 2012, and I jumped at the chance to get another [project] going. The Blizzard Voices is such a powerful, hard-hitting piece — it really brings a sense of relev ance and immediacy to its subject. 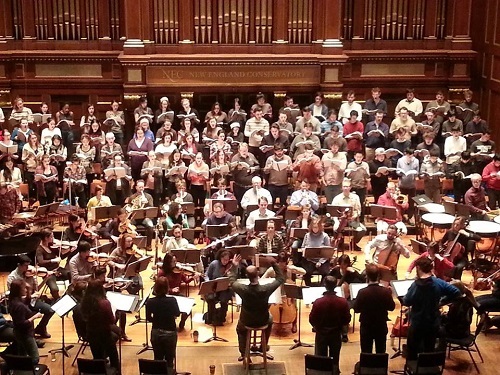 And of course — though I had no way of knowing when I decided to program it — the theme of winter giving out a thrashing is especially meaningful for those of us here in Boston this year.” Take a sneak peak during rehearsals and listen to some Moravec commentary here. More Moravec news: on March 10, The Mirabelle Trio gives the world premiere of Moravec’s Horn Trio at Vanderbilt University’s Blair School of Music in Nashville, TN.